If you’re looking to buy a new boiler and have been thinking about buying one from Alpha Innovation, this guide is what you need. Below, we’ll cover things like online reviews, Alpha boiler prices, and suitable alternatives from leading brands. Basically, in the next 5-minutes, you’ll know if Alpha are the right brand for you. Which Size Alpha Boiler Do You Need? Before we jump into the range on offer from Alpha boilers, it’s worth making a note of what size boiler you need. You can read our guide to boiler sizing here. Alternatively, you can use an automated boiler size calculator which can be found here. Simply answer a few clickable multiple choice questions, and you’ll get your recommended size on screen (these aren’t Alpha boilers listed here, but it’s a handy calculator). You’ll get a fixed price for brands other than Alpha on screen. We’ll keep those and compare them to local installers later in this article. Besides the kw output on offer, the main difference between the Alpha combi boiler range, is the warranty on offer. Ideally, you want to be aiming for a boiler with a warranty of 5-years or more. That’s not to say there aren’t cheaper alternatives with a lower warranty. There are plenty of boilers being offered with much less, 2-years on many occasions. 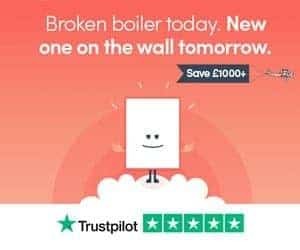 Whilst you might save a few notes now by buying a boiler with a lower warranty, it will come back to bite you. Typically, a boiler manufacturer is going to offer a warranty that matches the durability of the product. A 2-year warranty? Expect to be forking out for boiler repair bills soon. You’ll save £100-250 now on the overall installation cost, but risk paying for repairs, or possibly even a new boiler in just a few years. A 10-year warranty is huge. Even better, is the fact you can get an additional 1-year by fitting a Cyclone boiler filter. Or, you can go the whole hog, fit a Premier Pack, and get an additional 3-years, so 13-years in total! Alpha tend to be priced into the lower end of the market. For instance, their flagship combi in 30kw form, is only around £900. A lot of comparable brands would be charging this for a boiler with a much lower warranty. The biggest problem with Alpha is a lot of independent merchants don’t stock them, as they’re not massively popular with installers or homeowners. You tend to find that merchants focus on Worcester Bosch, Ideal Boilers, Baxi, Potterton or Vaillant. If we compare the E-Tec Plus (10-year warranty) with Worcester Bosch, it’s likely to be roughly £200 cheaper (not including installation). So, you could save money, if you can find an installer that fits them. For the 30kw Alpha E-Tec Plus, you’d be looking at £900 for the boiler, and a few hundred more for general fittings, a flue and a filter. The installation cost is likely to be in the region of £2,000. That’s comparable to something like the Worcester 30i when you use BOXT. As BOXT are part owned by Bosch, they get their boilers cheaper than average, and that’s reflected in the installation price; it’s going to run at a similar cost to Alpha boilers, and you’ll get the same 10-year warranty. This makes a huge difference. You could be getting a Worcester installed for a similar price, rather than paying £200-400 more. Basically, if you’ve already had a quote for an Alpha boiler from a local installer, it makes sense to get a comparison with another brand like Worcester, and you can do that here. If you’ve not had a quote from a local installer for an Alpha boiler, you can do that here. I tend to look at reviews, even if I’m buying a product for £20 or so. It makes sense to do the same when investing around £2,000 in a new boiler installation! As we’ve already mentioned, Alpha don’t sell in the volumes that other brands do, such as Worcester Bosch or Baxi. And, that makes finding reviews slightly difficult. The only Alpha boiler reviews we could find were here on Trust Pilot. Although some of the reviews uncover important issues, due to the fact there are less than 20 at time of writing, we don’t feel it gives a fair assessment of the company or the quality of their boilers. The question is, should you buy an Alpha boiler? One thing Alpha really does have going for it, is the long warranty being offering with the E-Tec Plus. 10-years as standard is long enough, but there are options for a further 1 or 3-years, which is impressive. There are plenty of other boiler brands offering similar products, at similar prices, and offering great warranties. As we’ve mentioned, the likes of Worcester Bosch boilers can be found for a similar price from a UK installer that has a connection directly to Bosch, you can check prices for them online using their price calculator. And, if you’re still not sure on the best route to take – we’ve covered our top picks for the best boiler companies here. For specific boiler model recommendations, we’ve created a guide to the best combi boilers too. Thanks for reading our guide to Alpha boilers. Hopefully, that’s given you enough information to make a calculated purchase decision, as well as a rough idea when it comes to overall installation costs. Still got questions? Drop us a line via our contact form, and we’ll get back to you as soon as possible. And don’t forget to bookmark Heatingforce.co.uk, we regularly post up boiler reviews and repair advice.